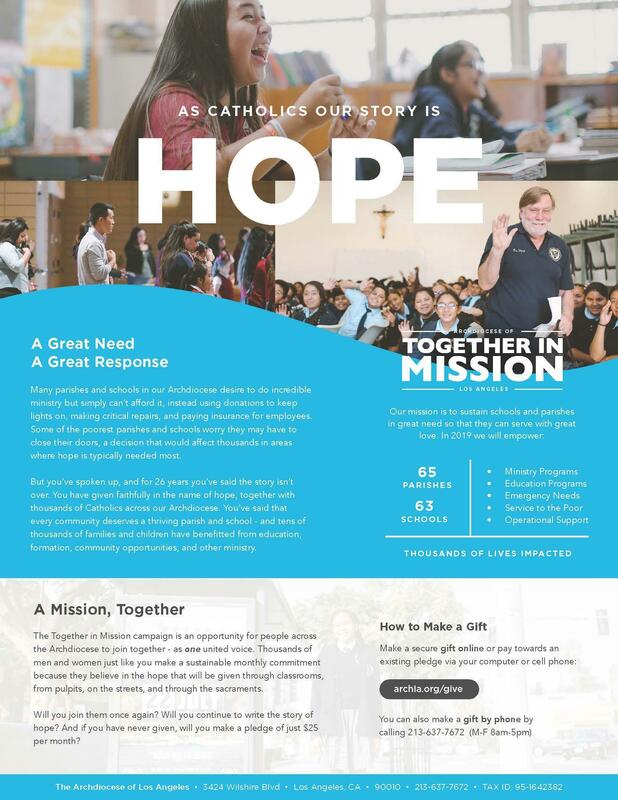 Help needy parishes & schools in the Archdiocese of Los Angeles! Make your pledge today! Click Campaign Video above for overview! Together in Mission provides substantial financial support to 65 parishes and 63 schools in our Archdiocese. In making a gift to the 2019 Together in Mission Campaign, you help to bring Christ's light - the signs of his love and his tender mercy - into the lives of our brothers and sisters who are hurting, who are broken, who are in need of healing. The funds we collect will directly benefit more than 500,000 of our Catholic brothers and sisters, and ensure our parishes and schools remain open as centers of faith and hope for the communities most in need. For those of you that have given to Together in Mission in the past, you will receive a letter inviting you to again participate in this year’s appeal. We prayerfully ask you to renew your generous support. You can complete your campaign envelope and return it as part of our regular Sunday Collection. You can also make a pledge (payable over 2 to 10 months by credit card) or a one time gift online by following this link: Together in Mission Online Giving. Please be sure to include our parish - SS. Felicitas and Perpetua - in the "Please credit my parish" section so that you help us reach our parish goal.